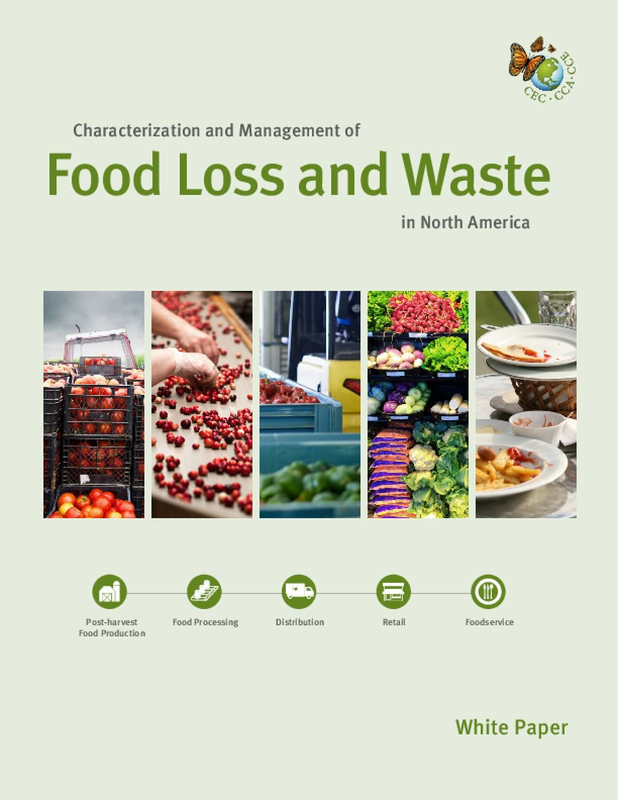 Policies and programs on food loss and waste (FLW) are gaining momentum across North America as awareness of the issue continues to grow. The Commission for Environmental Cooperation (CEC) established the North American Initiative on Food Waste Reduction and Recovery as part of its Green Economy and Climate Change project areas. This white paper characterizes FLW in Canada, Mexico and the United States and identifies opportunities for the industrial, commercial and institutional (ICI) sector, governments, and nongovernmental organizations (NGOs) to take action across the three countries. The scope of this research included post-harvest to pre-consumer stages of the food supply chain (i.e., post-harvest food production; processing; distribution; retail; and food service). Pre-harvest food production and the consumer stages of the food supply chain are beyond the scope of this study. This project complements the CEC's North American Initiative on Organic Waste Diversion and Processing, which examines composting, anaerobic digestion, and other industrial processes (e.g. rendering, biofuel) for FLW and other organic waste. The content of this white paper was compiled from primary and secondary sources of information in Canada, Mexico, the United States and countries outside of North America. Primary sources included interviews and email exchanges with 167 stakeholders representing various locations, organization types and sizes, and stages of the food supply chain. Secondary sources included reports, white papers, academic papers, news articles, media recordings and government databases, as well as a review of on-the-ground programs and projects implemented by the ICI sector, governments and NGOs. North American and international experts on the subject matter also vetted key findings during a three-day stakeholder session held in Canada, in February 2017.